Earn 100 percent completion and unlock all endings in A New Home of Detroit: Become Human. This walkthrough for A New Home in Detroit: Become Human will unlock 100 percent completion while obtaining the only possible ending. Most of the choices and actions here do not matter in how the rest of the game plays out, but two could have devastating consequences if certain paths are not unlocked. The 100% complete mission flowchart for A New Home. It's relatively straightforward earning 100% completion in the chapter known as A New Home. Players will encounter a few different braches, but by and large, they'll simply need to complete all activities on each floor of the house before moving on to eventually speak with Alice. There is only one possible ending in A New Home. When Kara finishes cleaning the second floor she will need to go back downstairs, at which point a cinematic will end the chapter. While this is the only possible conclusion, 100 percent completion of the chapter is preferred as there are two instances where Kara can unlock possible paths in Stormy Night. 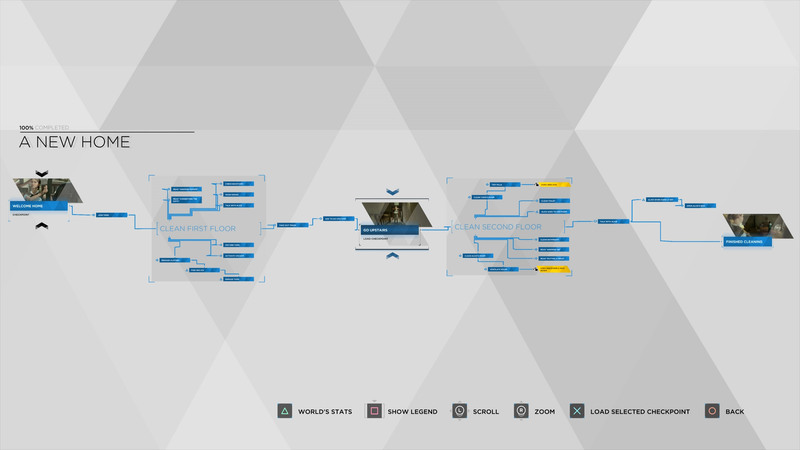 With 100 percent completion and all endings unlocked for A New Home, move on to The Painter, or head to the Detroit: Become Human 100 percent walkthrough to browse each of the game’s chapters with instructions on 100 percent completion and all endings explained.